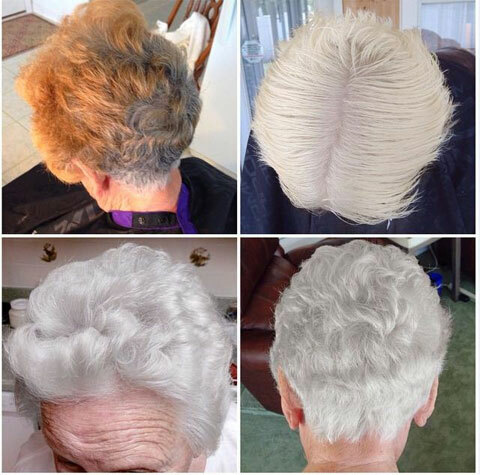 Colorist Marcus Byerly may only have been in the beauty industry for two years, but he has PERFECTED his process for transforming his grandmother from a box-colored brass to a beautiful gray. "My grandmother had been a victim of box color for deacades!" says Byerly, a freelance hairdresser in Knoxville, Tennessee. "I've had a passion for hair for as long as I can remember." Natural level 4 with 80% gray on top and 60% gray in the back. Pro tip: "I apply the lightener on the roots at the end of the application," he says. "This avoids hot roots and I can use a lower-volume developer." Process at room temperature for 50 minutes to a level 10 pale yellow. Apply a cap and process under a dryer if needed. Rinse and shampoo with Redken Blonde Idol and towel dry hair. Toning formula: Redken Shades EQ Gloss 1/2 oz 09V + 1/2 oz 09T + 1 oz Crystal Clear + 2 oz processing solution. Process for 10 minutes. Rinse thoroughly and deep condition with Redken Extreme Strength Builder Plus. Finishing: "I applied Matrix's Keratin Renewal Spray to the ends to attempt to help repair her ends and fix her existing cut--it was not done by me!" he says. "Grandma was blown away and loves her new hair!"